In light of National Spinal Cord Injury Awareness Month, Wheel:Life is going to tackle a heavy topic for our friends who have SCI as unfortunately, depression affects a great deal of the Spinal Cord Injury community. Depression is an illness that affects 1 in 20 Americans (over 11 million individuals) yearly, however it is even more common with the SCI world- about 1 in every 5 people with SCI is clinically depressed. Unfortunately, depression can cause isolation from family and friends and can negatively alter a person’s relationships as well. Depression hurts those surrounded by it and it is important to acknowledge that depression is an illness that represents a chemical imbalance, and not laziness or personal weakness. What is Depression & What Causes Depression? The prevalence of depression among people with SCI is higher than average due to the physical and psychological changes that occur in the body and is not to be mistaken with feeling short-term sadness. Although many of these feelings may seem normal after a major traumatic experience like SCI, these symptoms generally subside over a short time. If not, that is what categorizes itself as being medically depressed. Depression is not caused by personal laziness, or lack of will power; it is not the fault of the person who is experiencing it. In fact, the causes of depression are not fully known. It could be trauma like an SCI, the loss of a loved one, divorce, and financial trouble. We know scientifically that life stresses and medical problems can alter brain receptors, called neurotransmitters. The chemical imbalance can be linked to changes in sleep, energy, appetite, mood, and the ability to focus. For people who have spinal cord injury, the risk for depression is highest in the first five years after the injury, and these risk factors include being dependent on alcohol or drugs, lack of a spouse or a close support network, and access to lethal means. It is important to treat depression because it can have harmful affect on a person’s ability to function in day-to-day life. Thankfully, depression is treatable with antidepressant medications, specific types of counseling, or both. Among antidepressants, the chemical balance is restored and may also alleviate some forms of neurogenic pain. Another form of counseling can be “cognitive behavioral therapy” which is based on the idea that depression improves when people are engaged in meaningful activities and have a better self-image and attitude about themselves and their future. The therapist will try to help resolve the problems in order to improve the outlook and build confidence. Both options have had proven results, however each person is different so consult your physician in order to find the best treatment for you. If you are depressed, reach out and get help, including professional counseling or participation in a support group as soon as you can. Remember, you are not alone as many of your fellow SCI survivors have probably felt this way and maybe still are going through this painful illness. That’s why Wheel:Life offers a directory of support groups on our website to help you connect with friends who understand and can help. 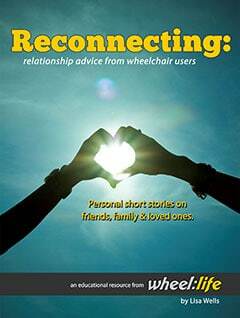 Within Reconnecting: Relationship Advice from Wheelchair Users, readers will hear from people who use wheelchairs as they share their perspective on friends, family and relationships including dating, marriage and parenting. 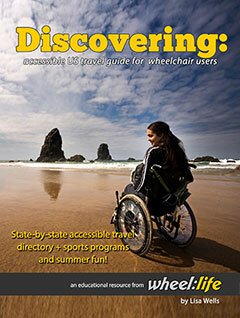 Author Lisa Wells shares real-life examples and success stories throughout the book based on her lengthy career that includes ongoing interactions with disability advocates, non-profit supporters and peer support group members. This article is not intended to be used or construed as medical advice, it is for informational purposes only. Please contact a medical professional for advice or guidance on physical and mental health issues.